Ashes of Creation Apocalypse castle siege gameplay. 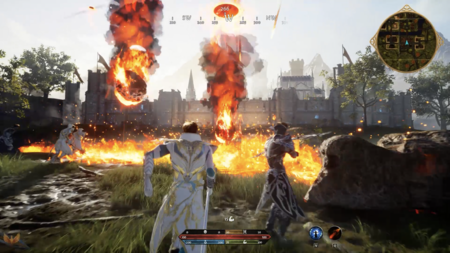 Ashes of Creation Apocalypse castle sieges are an Ashes of Creation Apocalypse testing mode that aims to test castle siege mechanics. Takes place in and around large destructible castles. Matches are expected to last thirty to thirty-five minutes. This duration can be modified by control points captured during the match. There will be 200 players in a match (100 v 100). Invite up to 20 guildmates to a match. 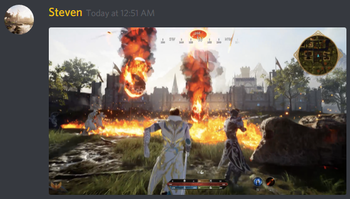 Class kits come into play during the testing of Ashes of Creation Apocalypse castle sieges. The ability to host a session and challenge an opponent or guild may be present post-launch of castle siege mode. ↑ Video, 8 March 2019 (0:00). ↑ 3.0 3.1 Livestream, 17 August 2018 (30:29). ↑ 4.0 4.1 Livestream, 1 September 2018 (54:06). ↑ 5.0 5.1 Castle Siege Overview. ↑ Interview, 24 August 2018 (13:17). ↑ Interview, 17 August 2018 (8:16). ↑ Interview, 6 December 2018 (38:10). This page's content was last modified on 18 March 2019, at 22:33.